During the Alamo siege, John Stroud is sent to Ox Bow to protect the townsfolk but, following a massacre, he infiltrates Jess Wade's gang of turncoat renegades supporting the Mexicans. In Arizona, Frank Slayton's gang robs a stagecoach and kidnaps Ben Warren's fiancée, prompting Warren to pursue Slayton. In 1877 Western Canada, a police inspector revolts against his inept commander, taking a safer route to the U.S. border in order to stop invading hostile Indians. Two brothers end up on opposite sides of the law in post-Civil War Texas. A gunfighter's main hope lies in the trust of a beautiful woman who hides him out when he is wrongly suspected of a stagecoach massacre. John Wesley Hardin: I don't back up from any man unless he was my pa. The"Badmen"of the West, the Jameses, the Daltons, the Ringos, and Youngers, are now part of American folk-lore. Research has added another name to the list- JOHN WESLEY HARDIN. Many motion pictures work on two levels – the way they read and the way they look. This is especially true of B-movies in the 1950s, when the studios would buy any old pulp screenplay and allocate a minimal budget with recycled sets and costumes, and yet turn over total creative control to a seasoned and professional director who used to be a big shot. This was the situation with virtually every Raoul Walsh picture from this period. He'd long since had his day, and his bosses gave him little more than turkey-material to shoot, and yet he continued to imbue every picture with the intensity and romanticism that had always been his hallmark. The Lawless Breed supposedly chronicles the career of real-life outlaw John Wesley Hardin. It announces itself as the result of "new research", and just as they used to say in Police Squad, only the facts have been changed. Hardin's two love interests, the names of people he killed, the number of children he had, not to mention his general character are all completely made up. Writers William Alland and Bernard Gordon have essentially invented a fictional character and given him Hardin's name. But the point of this is not to tell it as it really happened – this is a classic Western after all. The point is to give you a picture of the Old West and a typical Western hero as posterity has remembered them. And this is what makes it the sort of project Walsh would really get his teeth into. For Walsh, there was romance and nostalgia in the open plain. Look at how he begins the picture with rather confined shots of the town, with foreground business and buildings bordering the frame. Then when we cut to Hardin's childhood we are hit with the beauty of the wide open spaces. 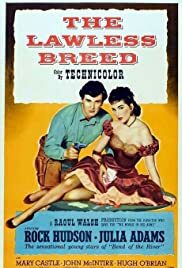 As opposed to the yellows and browns of your average Technicolor horse opera, this is an abundantly green West, and Walsh seems to have worked closely with cinematographer Irving Glassberg and art directors Bernard Herzbrun and Richard Riedel to bring this tone to the fore. Green here represents freedom, hope and the good life, and it either covers the screen or retreats to a distant corner as appropriate, even worked in as a reminder during indoor scenes, such as the tree outside the window when he visits Jane by night. In his monochrome pictures Walsh would often use lighting to chart the hero's rise and fall (They Died with their Boots on (1941) is a good example), and here he uses colour to the same effect. The bold greens give a warm and homely feel to Hardin's cherished dream of a farm, and whenever he drifts away from that dream we turn to stark off-whites. In the leading role Rock Hudson is a middling success. He's just too steady and self-assured to convince as the young, hot-headed outlaw. On the other hand, he develops very well into the older and wiser Hardin, and as he would later show in Giant (1956) his forte seems to have been playing middle-aged. As is typical in a Walsh Western, the rest of the cast are an appropriately motley bunch, with no shortage of dusty faces and grizzly whiskers. Even though their performances aren't exactly outstanding, John McIntire hits the right notes in his dual role as Hardin's father and uncle, and Julie Adams is tough and unglamorous enough to portray both the saloon lass she starts out as and country wife she becomes. Also worth a mention is a young Lee Van Cleef, in one of his numerous third-baddie-on-the-left appearances before he became a big star in Italy. Although Hugh O'Brien is ostensibly the leader of the Hanley clan, it's clear Van Cleef's menacing presence was being noticed, as he is given all the most threatening lines and bits of macho business. There's no escaping the fact however that as written The Lawless Breed is a rather lacklustre affair. The dialogue throughout is either corny or simply dull. A set-piece like Hardin continuing to play cards after being given an hour to get out of town doesn't seem able to decide whether it is being played for tension or for laughs. And yet there is a precious handful of moments which Walsh has been able to stage with pure and compelling visuals, such as the confrontation with the Hanleys on a windswept street or the ageing hero's bittersweet return to his home and family, and these are absolutely stunning. And such is Walsh's devotion to the feel of the picture even the most boring of scenes looks nice and fits in with the tone of the whole piece. The story may be a poorly-written rough-shod ride over the truth, but in its imagery The Lawless Breed has a beauty that is engaging and sincere.